Featured / Recipes / 01.10.2016. 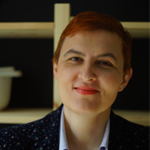 Originating from Dalmatian Hinterland and the town of Imotski, this cake unites typical ingredients of this area and the filigran preparation and decoration. 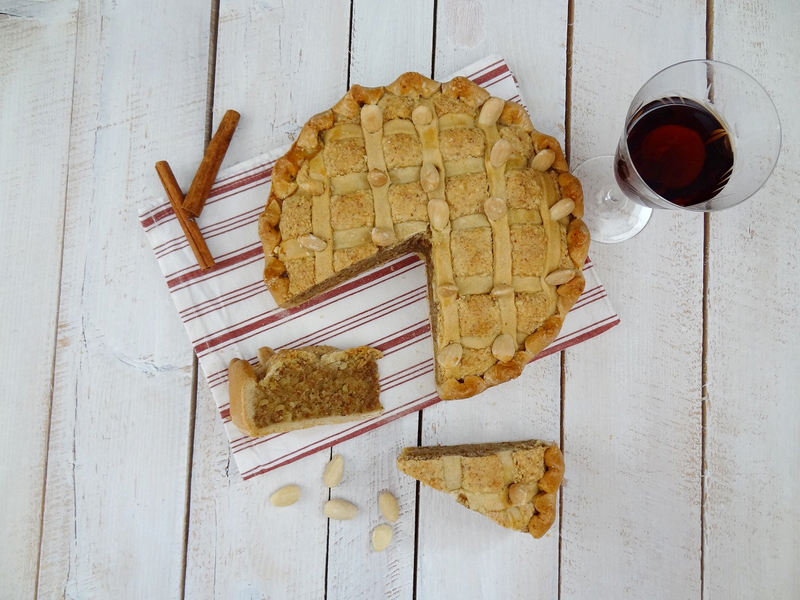 Pastry scented with cinnamon, nutmeg and prošek sweet red wine is intertwined with rich filling made of almonds, maraschino and citric fruit. 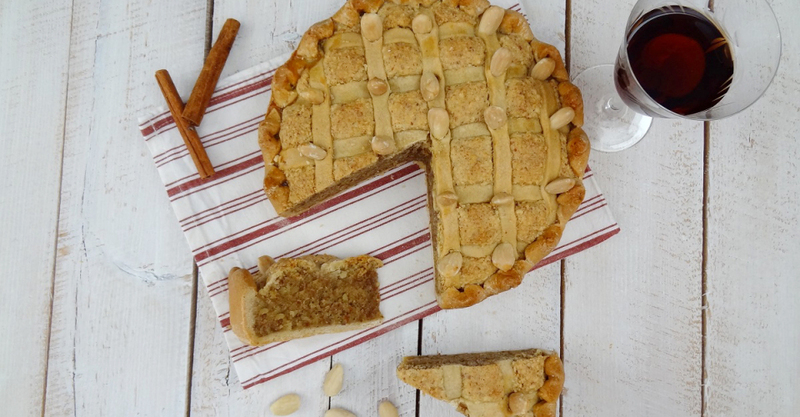 Decorated with stripes of pastry and blanched almonds, it will definitely lure the glances. And the taste… you definitely need to find a place for it in your selection of sweets. In a large bowl mix the eggs and sugar. Add seasonings, melted butter and prošek sweet red wine. Sieve the flour and gradually add it to the mixture. The pastry should be soft, but it should not stick to hands. Slightly flour the surface and knead the pastry for a few minutes. Wrap the formed ball in a plastic foil and leave in the refrigerator to cool a bit. For filling, chop the almonds in a blender. Mix eggs, sugar and vanilla sugar with an electric mixer in a bowl until you get a homogenous light mixture. Add grated lemon rind, orange rind and juice, maraschino and continue to stir. In the end add almonds. Coat a round cake mold (22 cm/9 in diameter) with butter and evenly sprinkle with flour. Thin 2/3 of the pastry to a round shape of 5 mm thickness, in the manner when the pastry is moved to the mold it goes over the edge of the mold. Move the pastry over the mold and slightly form it according to an inner part of the mold. Then evenly distribute the filling. Thin the remaining third of the pastry and with a circular cutter cut the stripes of even width. Place them horizontally and vertically over the filling with even distance. Remove the excess stripes with scissors and tuck them between the pastry and filling. Remove the excess pastry outside the mold a bit lower than the mold edge. For every 2.5 cm/1 in cut the pastry with scissors and imprint upper edges downwards in order to get a triangle. 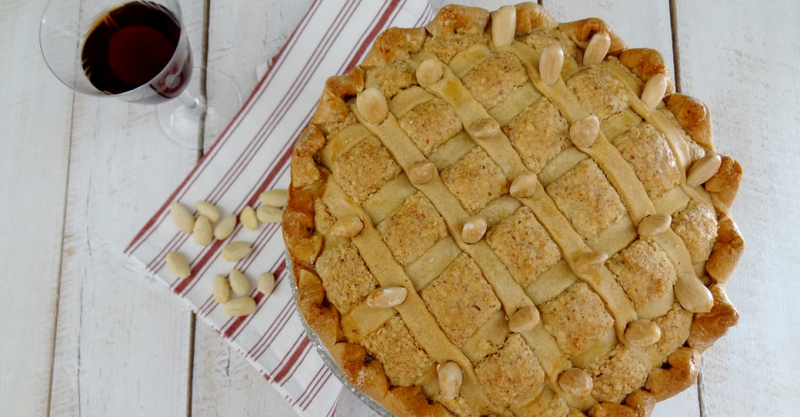 Coat the pastry with egg-white and at places where the decorating strips overlap, make an incision and imprint blanched almonds. Bake the cake in an oven previously heated to 170 °C (338 °K) for about 15 minutes, and then reduce the oven temperature to 150 °C (302 °F) and continue to bake for another 45 minutes. Remove the cake from the mold and let cool for 20 minutes. Slice it and serve with prošek.